This is an adventure to remember! You will get to see some of the most stunning river and countryside England as to offer. You will paddle yourselves into 2 fantastic camping locations, using only the canoe as your mode of transport, away from the common trappings of modern life. You will begin in Bedford at Longholme Café and Boating Lake, we will kit you out in paddling equipment before giving you full bank tuition and then you are ready to set off. After a stunning paddle through the countryside you will arrive at Matchstick Wood, on the banks of the river. You will get your own private clearing in the woodland, complete with long drop loo, log store and most importantly campfire, to sit round under the starry night sky. 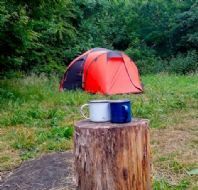 Once you’ve pitched your tent, have the campfire roaring with the wine/ beer cooling in the brook this trip will seem like the ideal tonic to a busy life, allowing you to time to relax after a good days paddle. The following day, you will have a stunning paddle through some of the best voted wild swimming sites in the UK, winding your way through the leafy countryside before arriving in St Neots Campsite on the edge of the market town. After another peaceful night, you will hit the water for the final day and re-live some of the sights from the day before, finishing at Great Barford.